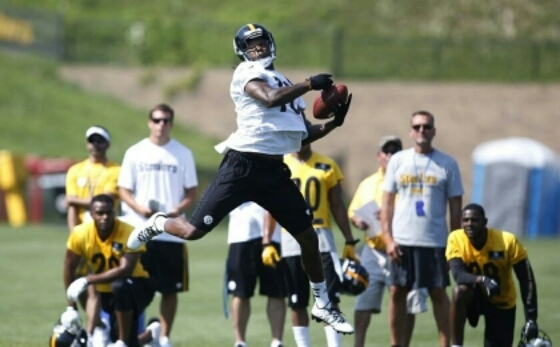 Bryant To Have Breakout Season For Steelers | "IT'S A STEELERS WORLD"! Pittsburgh Steelers wide receiver, Martavis Bryant spent the first six games of 2014, his rookie season, on the inactive list and then impressed when finally given a chance, averaging over 21 yards per catch and racking up eight touchdowns in 10 games. The 23-year-old spent the off season working hard in hopes of making an impact immediately in his second year. Like I had stated in a previous article, Bryant has the opportunity to take over the #2 receiver spot from Markus Wheaton. Even if he remains as the #3 his work ethic and skill set will propel him up to becoming a very scary #3. Because the stats he put up in just 10 games was an incredible feat, and I can easily see the Steelers producing two 1,000 yard receivers this season in Bryant and Antonio Brown. Just another player to add to the ‘Killer Bees’ of Ben, Bell and Brown..Martavis Bryant in his second year is most definitely going to be a sight to witness.